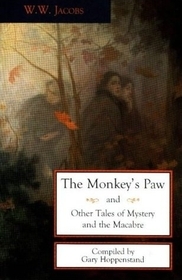 The story of "The Monkey's Paw" has been revised, remade, and duplicated so many times that it seems nearly impossible for one not to have heard of the premise at least once in their lifetime. The fact that the story has been redone on countless occasions, from Tales from the Crypt to Are You Afraid of the Dark?, is a testament to the timelessness that the tale holds. It is in the vein of the traditional ghost story, the type of yarn that is swapped during sleepovers, camping trips, windy autumn nights, and cold winter evenings. The narrative combines the atmosphere of the horror story, with its dreary mood steeped in death and black magic, with the same motifs found in ancient legends. The old couple comes upon a magic talisman that can make their wildest dreams come true. It's the best thing to ever happen to them! Or is it? Like Adam and Eve tasting the forbidden fruit, the family finds out that there are some things that are better left undisturbed. The Whites' intentions are pure and innocent enough and undeserving of the terrible repercussions that follow. But Fate has other designs for this family and will not allow them to interfere with its master plans. The same lessons in morality demonstrated in fables are apparent in this story as well, giving it the ageless feel of the world's oldest myths and tall tales. "The Monkey's Paw" is considered by many to be one of the greatest horror stories ever written, and I would wholeheartedly agree with this statement. It is a great tale to introduce a newcomer to the terror genre with, a story that will enrapture the reader with its spooky ambiance and fable-esque presentation. Despite being over a hundred years old, the tale is easy to read and moves at a beautifully smooth and brisk pace. It either can be read in the seclusion of a dark bedroom or told aloud amongst comrades in a warmly lit parlor. The terror of the story will creep into the hearts of the listeners regardless of the surroundings. So invite the family over for food, drink, and merriment. Bring them into the dusky living room to recite a tale to them that they shall in turn recite to their children. And, most importantly of all, let the story remind you of the mysteries of the dark and of wishes best left ungranted. Submitted by monroevillezombie on Sat, 2010-07-03 17:59. This story is one of the reasons I'm obsessed with horror. I know it's kind-of been done to death, but I'm working on an adaptation of this story - along with "The Hitch-Hiker" and an as-yet-unchosen story - for an anthological horror film I'm doing with Yellowberri Films (my production company, http://facebook.com/ybfilms). Submitted by Bruce Jordan on Mon, 2010-07-05 17:58. Classic story, and another great article. I actually heard this story for the first time at a 4-h camp when I was 7, and you are absolutely correct in saying this is a great tale to introduce people to the genre. Thanks again for your excellent work! Submitted by Dinosaur1972 (not verified) on Tue, 2010-07-06 10:57. One of my favorite ghost stories of all time. Christopher Lee recorded it for the BBC a few years ago ... he did an incredible job.